This week, the Coresight Research team was at World Retail Congress 2018 in Madrid. There, we heard senior executives from China’s two e-commerce giants—JD.com and Alibaba—speak about what makes Chinese retail unique and what the future of retail could hold. Richard Liu, Founder, Chairman and CEO of JD.com, talked through some of the factors that make Chinese retail distinct and offered his views on the future of retail. He said that European retail tends to change more slowly than Chinese retail does, and he pointed to a lack of loyalty among Chinese consumers as one of the reasons. He noted that shoppers in China are more likely to try out a new store when it opens than shoppers in Western markets are. Liu also said that Chinese consumers have shifted from looking for low-price products to opting for premium brands. Looking ahead, Liu pointed to the brick-and-mortar formats that JD.com is rolling out, including a new fresh-food supermarket format. Liu noted that the first two stores were “not in the best locations,” as international retailers such as Walmart and Carrefour had already captured those locations, but he said that the supermarkets’ positioning as “lifestyle” formats will encourage younger shoppers to drive to them. JD.com also plans to put convenience stores in thousands of Chinese villages. The company’s ambitions are staggering: last year, Liu stated that JD.com aimed to open 1 million convenience stores over five years. Earlier this week, he said that the company aims to open 1,000 such stores every day by the end of this year. We also heard from an executive at JD.com’s biggest rival, Alibaba. 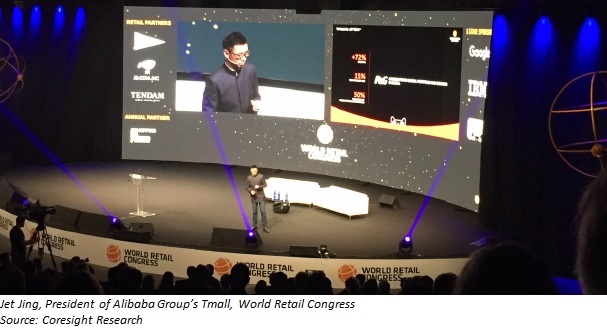 Jet Jing, President of Alibaba’s Tmall marketplace, highlighted the appeal of Tmall and its sister site, Tmall Global, for those Western brands and retailers that are seeking to capture a share of the high-growth Chinese market. Jing said that Tmall is the “gateway to China” and that Western retailers don’t have to put up with just surviving with Amazon, because they can thrive with Tmall. Some 18,000 international brands have sold on Tmall in the past few years, and they are reaping the rewards of China’s continued strong spending growth. Jing pointed out that there has been a major switch from a “made in China” market to a “consumer in China” market, and that firms selling on sites such as Tmall are benefiting from a 40-year opening up of the Chinese market. However, those brands and retailers need to cater to Chinese consumers’ taste for product newness and innovation, Jing said. He suggested that brands need to undertake rapid product innovation and predicted that those that do not innovate in China will die. Happily, Tmall can help these brands innovate, according to Jing. He noted that consumer packaged goods giant Procter & Gamble used big data analytics to identify consumer trends in China and then rapidly tested dozens of new products by listing them on Tmall. The company saw a sharp reduction in the time needed to develop products and enjoyed a significant boost to its Chinese sales from the test products. Jing commented that it has never been so easy to run a business in China. At the same time, his comments on innovation are a reminder that, in categories such as consumer packaged goods, selling successfully on marketplaces such as Tmall requires greater commitment than simply listing products.